OK, let's activate your vouchers! Enter your information below and we will add the airline voucher Global Points to your account. 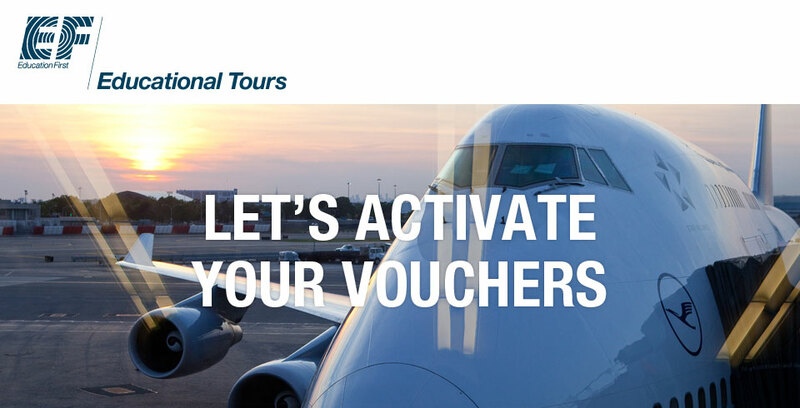 *The qualification period for the airline voucher incentive is for each six new paying travelers who enroll between March 4, 2014 and April 30, 2014, for tours traveling from Oct. 1, 2014-Sept. 30, 2015. Each paying traveler must have made at least a $595 payment no later than June 15, 2014 or be enrolled in the Monthly Payment Plan. One domestic airline voucher is valued at 250 global points, two domestic airline vouchers are valued at 500 global points and one international airline voucher or three domestic airline vouchers are valued at 750 global points. Qualified Group Leaders will be notified of their voucher(s) earned on July 1, 2014. Qualified Group Leaders must activate the voucher(s) for a corresponding global point value to be applied. Once global points are applied to an account, points may only be used on EF’s Flight Finder. Any subject global points not redeemed for flights on EF’s Flight Finder will expire on March 31, 2015. EF reserves the right to remove un-used subject global points from accounts after March 31, 2015. The airline voucher incentive cannot be exchanged for cash or combined with any previous airline voucher incentives.